When will I get my order? : Production Time: 5 business days plus ship time from MA. 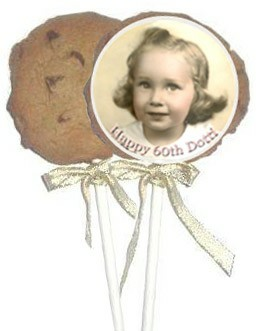 These photo cookies are freshly baked and decorated with your image. The images is edible food coloring, so you can eat the entire cookie. Cookies are sold by the dozen and cost $4.67 each. They measure 3.5 inches and the image measures 3 inches. They are individually wrapped in cello bags with ribbon. Sticks are 8." 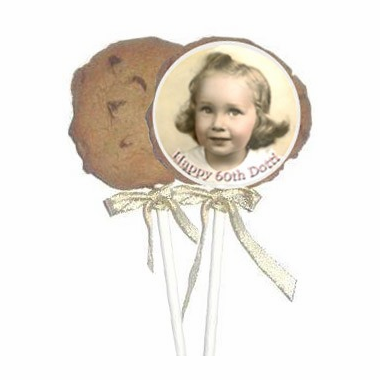 Choose from fresh baked sugar, chocolate chip, oatmeal raisin, M & M, and chocolate white chip. Please give us the date you want the cookies delivered by under "Event Date". The photo needs to be at least 3 x 4 inches and the resolution needs to be 150 pixels. If you are not sure what that means, simply email your photo to us, and we will let you know if it will work.